Samsung Note Split Screen Galaxy Note 8 - Focus on Samsung Note Split Screen, this tutorial for Samsung Galaxy Note 8, but you may try on Galaxy S9/S9 Plus or all Galaxy Notes versions. If you a new owner need to learn how to use split view on Samsung Note series or Galaxy series you are on the right way. Amazing features Galaxy Note 8 is split screen or dual screen available to watch on your device. Samsung display technology is Super AMOLED display. This Samsung Note Screen provides an exceptional viewing experience offers a wide range of colors with an incredible degree of color clarity which translates into far greater resolution astounding 100,000:1 contrast ratio, also automatically adapt various lighting environments to make Galaxy Note owner's easier on the eyes while providing the best possible picture quality while playing games or watching your favorite multimedia can do both of them. 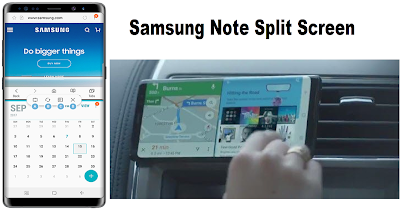 Samsung Note Split Screen is a display technique in Samsung Note device graphics that consists of dividing graphics and/or text into non-movable adjacent parts, typically two or four rectangular areas and the split screen technique can also be used to run two instances of an application, possibly with another user interacting with the other instance. You can access Multi window app by touch Recents. Manually to launch Samsung Note Split Screen with Multi window app, touch Multi window on the title bar. If you need to open another app on Samsung split screen, touch the second app from recents or App list. Touch the second app you want to open in split screen view, just that. To exit Multi window or dual screen mode, touch Window controls and close. Snap window this features use to snap the selected window to the half of the screen it occupies. Switch windows can help switch locations between Multi window apps. Open in pop-up window, Open the selected app in pop-up window. Close app used for close the selected app. Any Samsung user said that Galaxy Note 8 problems when switching to multi window when using the long press on recents button to shrink current window. Device completely freezes when switching quickly between apps using the long press, and another user had the same problem on my Samsung Note 8 after the Oreo update. For this Samsung Note Split Screen problems, please be sure to tap ✓and Accept as Solution on your settings hope that works for you. For now, you had learn Samsung Note Split Screen especialy for Galaxy Note 8, and stay with us for an upgrade Galaxy Note 9.